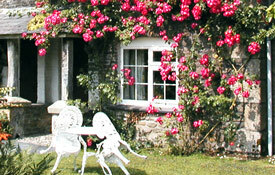 Selection of 11 'homely' holiday cottages centred around the green in their own private hamlet. Located in Pelynt, nr Looe. Dogs welcome at additional cost. To go back to England pet friendly accommodation click here. Tremaine Green Cottages form a beautiful private hamlet of real Cornish cottages, ideally situated for coast and moors, and set in award-winning grounds (a film set location). Fantastic location and accommodation where many guests return year after year ... as one of our previous guests summed it up ... 'our little piece of heaven'. Accommodation on offer ranges from 1 - 3 bedroom cottages, 2 pets welcome per cottage. Tremaine Green is located 2 miles from the Coast, between the picturesque harbours of Looe and Polperro. Our cottages are all decorated with antiques and curios from the trades of a bygone age, from the 1640's Farmhouse to the 1760's Ploughman's cottages. Sympathetically restored with all mod cons, crisp cotton sheeps and cosy duvets, the cottages and hamlet make an ideal 'Home' for your holiday. The 11 beautiful traditional stone cottages, sleeping 2 - 8, are centred around the green in their own private hamlet. Relax in the tranquil charm and splendour of the award-winning grounds. Close to beaches and walks near Looe / Polperro / Fowey. Ideal for families and romantics with play areas, putting, tennis, games room, barbecue, etc. 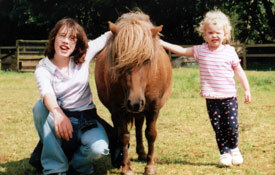 Children love to feed to the ducks and miniature ponies and the pygmy goats are also a big hit. 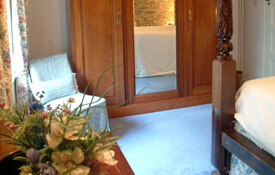 Most cottages have an antique four-poster or half-tester double bed in the main bedroom. All cottages are well equipped and double-glazed with oil fired central heating and many have log fires for a cosy evening in, or for a winter break. There are numerous attractions nearby - beaches, forest walks, animal parks and coastal walks are but a few, and we have a well-stocked brochure information point. Looe and Polperro are only 4 miles away and the Eden Project, the Lost Gardens of Heligan and others are within easy reach. Take a drive or walk through the fields to the village of Pelynt (one mile) which has a large village shop, butcher's, a highly recommended restaurant and 16th Century pub. Our office at Tremaine Green is open most mornings, but should you need us during the day/night our house is on site. You can hire tennis rackets and videos or just call in to the office for a chat if you want to know more about the area or which beaches are best. There are many super dog walks and coves / beaches where your dog can splash around. All in all, Tremaine Green offers a memorable holiday and this is why so many of our guests return year after year. Rates include towels, bed linen, electricity and standard heating (Mid-September to June). Additional cleaning and heating during your stay can be arrange at cost. Short breaks are available from October to April in advance, and all year at 3 weeks notice - minimum 2 nights stay / 7 nights during Christmas. If you have to cancel, your deposit is forfeited at the discretion of the Proprietors who will try to re-let the cottage at a cost of £25. If this is not possible, the Hirer is liable and must pay the total holiday cost. You are strongly recommended to take out appropriate holiday cancellation insurance.